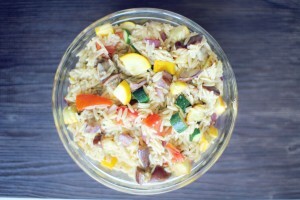 Grilled veg and orzo salad combines two of my favorite things, pasta and grilled vegetables. 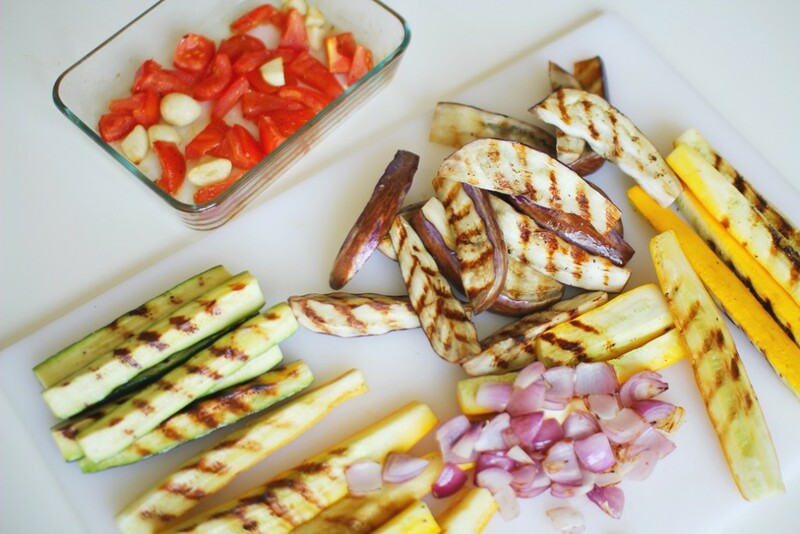 I really can’t get enough grilled vegetables lately. So tasty! I’ve declared my love for pasta many times on this blog. It’s so demonized in our society which is such a shame. Did you know pasta’s glycemic index is lower than oatmeal? It changes slightly based on how long it’s cooked and the variety etc. It’s usually lower glycemic index or similar to oatmeal. Plus, why hate on pasta- it’s a really great way to get your family to eat a serving or more of vegetables. See Pasta Primavera, Shrimp and Zucchini Capellini, Homemade Mushroom Ravioli, and Homemade Vegan Ravioli. This recipe is super quick and can be thrown together with whatever vegetables you have on hand. I think Israeli couscous (the larger variety) would be really great with this as well. Though, I love the starchiness of orzo. It works as a main dish or as a side dish. 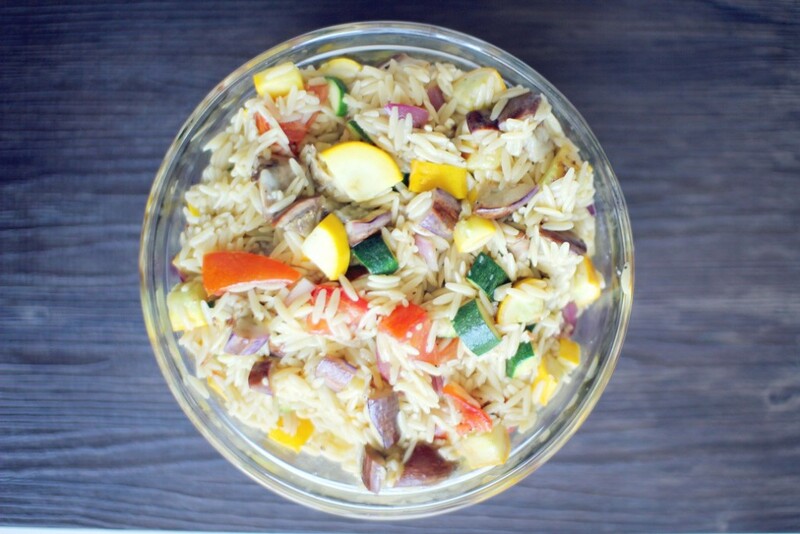 Grilled vegetable and orzo salad. Can be a great side dish or a main dish. Boil vegetable stock or 2 vegetable stock cubes in 4 cups of water. Add orzo to boiling liquid and cook covered just until liquid is MOSTLY gone- 10-15 minutes. 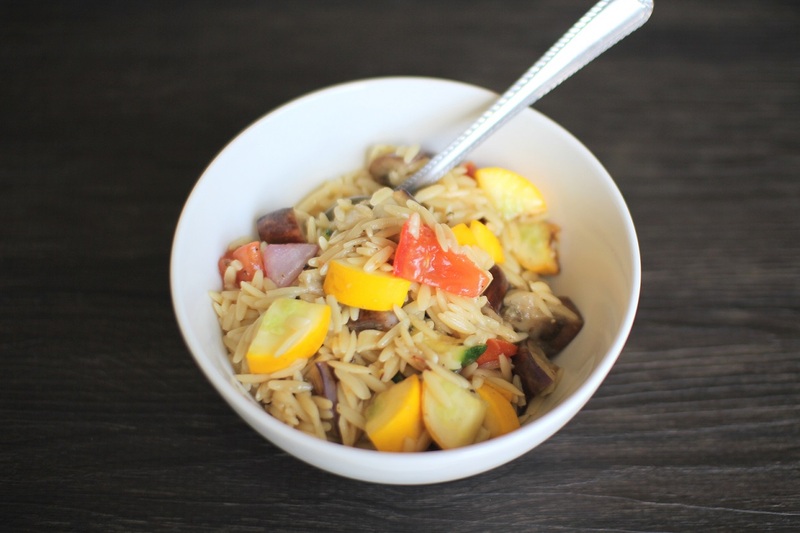 The starch from the orzo will combine with the left over liquid to make a creamy texture. Depulp tomato by cutting it and pushing seeds out with fingers then cut it into bite sized pieces. Peel and cut garlic in half. Add tomato and garlic to a baking dish, toss in a light coat of olive oil, and season with salt and pepper. Bake tomato mixture for about 20 minutes. Mince the garlic once roasted. Cut your zucchinis and eggplant into spheres to grill. Lightly brush with olive oil and season with salt and pepper. Grill until tender and grill marks appear, then chop into bite sized pieces. Cut the ends off your onions, peel it, and then quarter it. Grill or roast your onions. Juice two lemons and add 3 TBS of olive oil to the juice. Season the dressing with salt, pepper, and garlic powder. Now combine all ingredients in a bowl, taste and adjust seasonings, and enjoy it while it is still warm.